Falmouth, as viewed from east of the village – ca1880s. The village of Falmouth, Virginia sits along the left bank of the Rappahannock River one to two miles upstream from Fredericksburg. Established in the early 18th century along a river ford, Falmouth enjoyed the benefits of being situated along a major avenue for regional traffic. 19th century roads, railroads and a canal, however, all bypassed Falmouth and linked Fredericksburg with other communities. 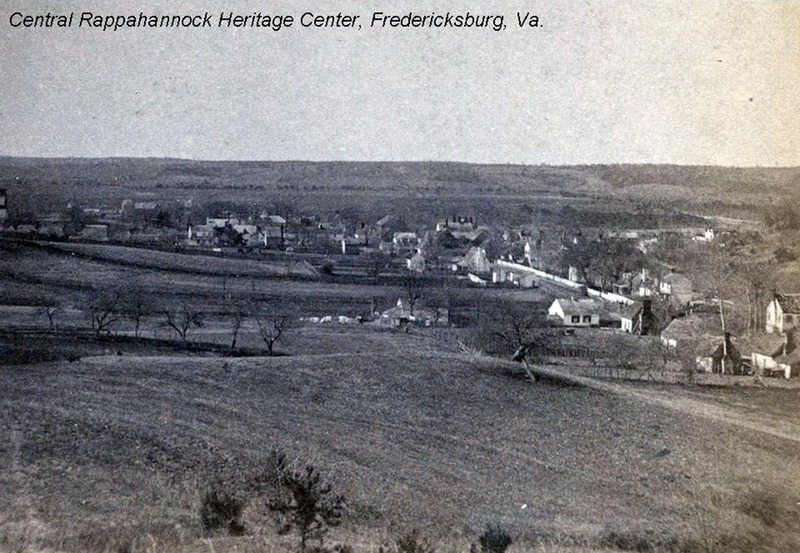 By the Civil War, Fredericksburg eclipsed Falmouth as a regional commerce center. When the Union army arrived in the spring of 1862, Falmouth consisted of a small collection of houses, warehouses, a church and other buildings. The river ford was important to the armies and Falmouth became a strategic location. Some of the soldiers, who spent their time here, left their names to be remembered 150 years later. A handful of antebellum structures remains in Falmouth. Located at the intersection of King Street and Cambridge Street is a small non-descript brick warehouse. The warehouse is known locally as “Lightner’s Store,” named for its 20th century owners and use. Some sources place its construction in the 1830s by the wealthy entrepreneur Basil Gordon. During the Civil War it was the property of Duff Green. On the front of the warehouse, next to one of the doors, is the faint remnant of graffiti left by a Union soldier. James Collins was a 28 year-old farmer and New York native living in Trowbridge, Michigan. He enlisted in August 1862 in Company I of the 5th Michigan Cavalry. Collins’s regiment joined the Union Army of the Potomac in June 1863, thus missing the Battles of Fredericksburg, Chancellorsville and the 1862-1863 occupation of Stafford County. Determining when Private Collins might have been in Falmouth and taken the opportunity to carve his name on the side of Duff Green’s warehouse reveals a very interesting period in Falmouth’s wartime history. “I was ordered to take six men and a corporal, and to take the advance of the regiment. I went ahead until I reached the heights back of Falmouth. There I saw that a large force of rebels were in Fredericksburg. We started on foot to make our way into Falmouth. Part of the way we would have to expose ourselves, and every time we did so, a perfect shower of bullets would fall all about us. We…reached the main street of the village without harm. This street ran toward the Rappahannock River, on the other side of which was Fredericksburg. In order to see all I could of the situation of the rebels, I crawled up beside a house and put my head out from the corner just far enough to see across the river. Harris, Collins and the rest of their regiment camped on Stafford Heights and picketed the area between the Lacy House at Chatham and the streets of Falmouth for about a week. 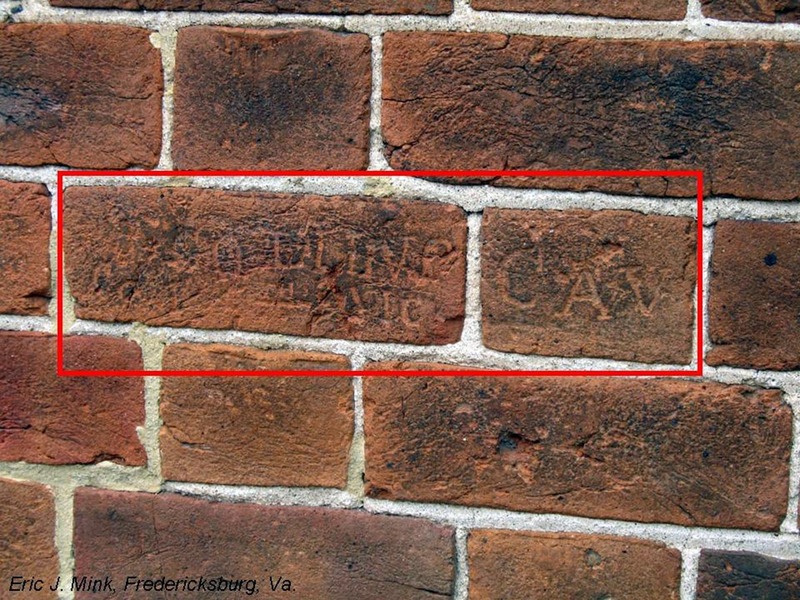 During this time is probably when Private Collins carved his name on the warehouse exterior. Private Collins did not have much more time in the army. On November 27, 1863 he was taken prisoner at Morton’s Ford along the Rapidan River in Orange County. 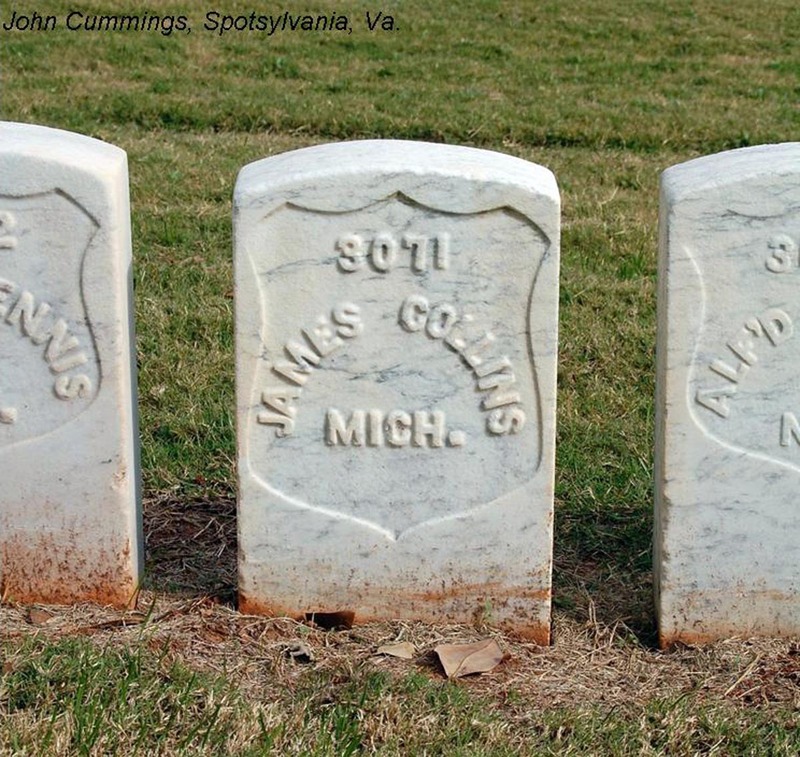 Sent to Andersonville Prison, Private Collins died there on July 9, 1864. He is buried in Andersonville National Cemetery in Grave 3071. 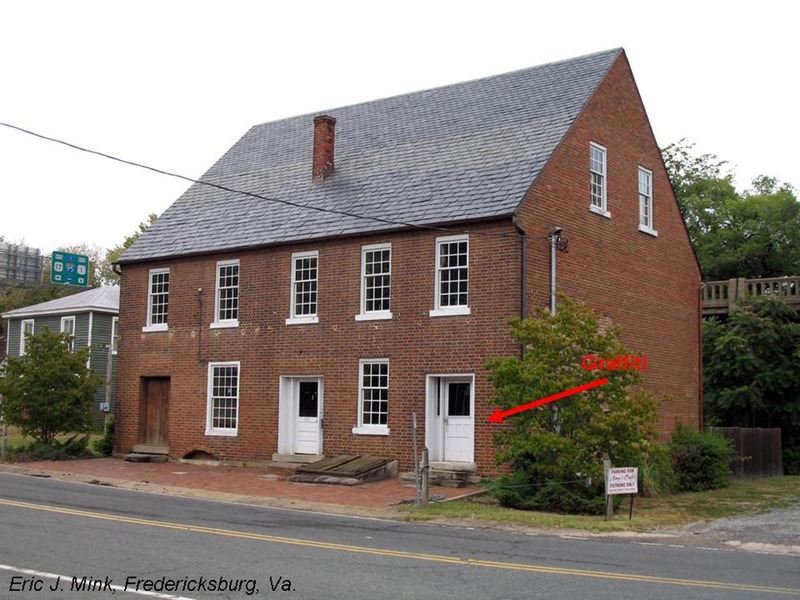 The Duff Green warehouse (aka Lightner’s Store) is private property. Thanks to Norman Schools for the heads-up on this bit of history. Nice bit of research, Eric. It reminds me of the “Kilroy was here” graffiti of WWII. Talking about bringing lost history to light! Brings things full circle. A face in the crowd now has his story told. Could he ever have imagined?